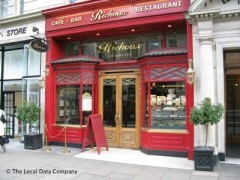 About: Richoux is a tea room which also serves Continental food at lunch time and dinner time. The menus are set and include a full English breakfast. A wide range of teas and coffees are also available. They have one of the worst customer service and theft has occurred many times there. I was eating dinner here on a Saturday evening and my bag was stolen with everything inside. I realized this quite quickly, and started making phone calls to stop by credit cards. Then as I was making the calls, the waitress came in and asked me to pay for the bill. I found it quite ridiculous as they knew I didn't have any form to pay, and my friend had a limited amount on her as well. That was the last thing I needed when I was making calls to stop my bank cards and etc. What also ****ed me off was that apparently one of the waitresses had realized that there was something odd about the thieves, as they left too quickly. But when she mentioned that to the head waitress, she had dismissed the concern seeing the bill was paid. (Of course they just had drinks apparently) They did not think to check on any of us who were sitting near the party. This theft was the third that had happened in the past year apparently, and although they were aware that their they had not taken particularly effective precautionary measures. I was extremely upset with this whole incident and how badly they had treated us afterwards, and had asked the manager to give me a call, and asked for the money back for the dinner. He did and I had asked for the amount of dinner to be refunded. I thought the waitresses could have handled things better and had checked as soon as the thieves had left, and so it was a reasonable argument. He said he would check but never called back. Needless to say, on top of the fact that their food was not that great (Overly priced for an average meal. I guess based on location), it did not give me a great impression at all. Came here for breakfast early on Sat 1st July 2006 after long drive from the West Midlands. Warm welcome from staff, calm atmosphere and excellent food. I highly recommend the Eggs Florentine which was delicious and beautifully served, also lovely hot chocolate. Service was speedy and efficient, no loud music which is a great plus, newspapers available while you wait/eat and handy location for tube train travel or walkers in need of sustenance. Great way to start the day!! Look forward to my next visit soon. Thanks Richoux. Loved it. We came here for breakfast, and were very disappointed. Although both darjeeling and earl grey teas were on the menu, neither was available. The pot of peppermint tea was brewed with only one teabag -- way too weak. The eggs benedict were overdone. The price for an English breakfast was way too high.